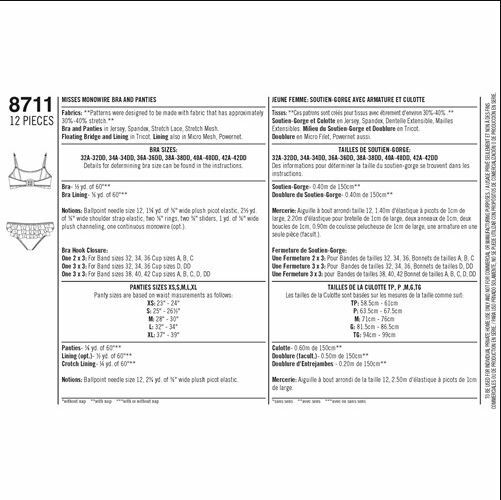 The Madalynne x Simplicity 8711 is an underwire bralette with an interior frame, called a floating bridge, that holds a continuous monowire for support. The monowire combined with bust darts creates a bralette that gives shape and doesn’t flatten. The bralette also has a hook and eye closure at center back and adjustable elastic shoulder straps. Underwear is a low rise style with 3 tiered flounces on back. The bralette is available in sizes 32A-42DD and the underwear is available in sizes XS-XL. International shipping is available. If you live outside the United States, choose the international shipping option at checkout. Shop Madalynne’s DIY lingerie kits here.